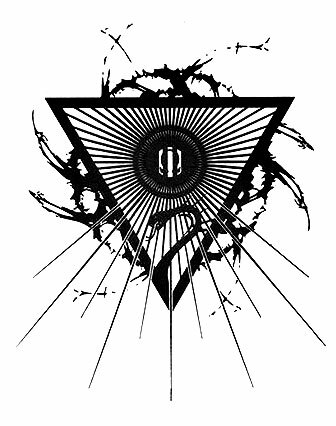 Clavicula Nox is Ixaxaar’s occasional magazine which they have been releasing since 2004. Beginning as an A5 booklet, Clavicula Nox has grown in size and quality to the point that this issue comes in four different editions, and some of them are pretty swish. 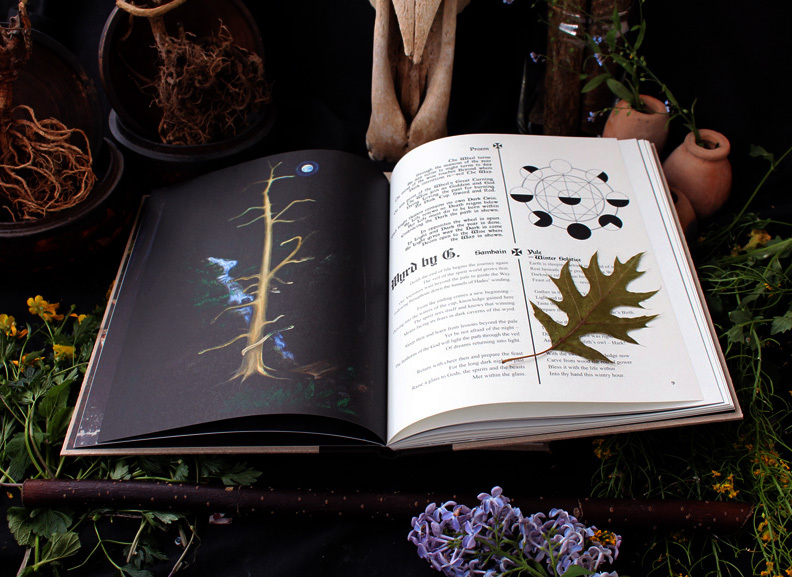 The regular edition is professionally printed, with thick brown covers and perfect binding; a limited version comes in an edition of 300 copies; while the super deluxe box editions comes with samples of flying ointments from Sarah Lawless, handmade magickal diaries, and various herbs, seeds, and animal parts, all packaged, in the case of the most limited set, in an antique wooden box. Being pretty sure that customs wouldn’t be too happy about assorted animal and plant parts coming into the country, I forwent the deluxe options and ordered just the collector’s edition. This edition still feels pretty special though, with its cover only half-bound, leaving the cardboard raw for a lovely and unique archaic effect. 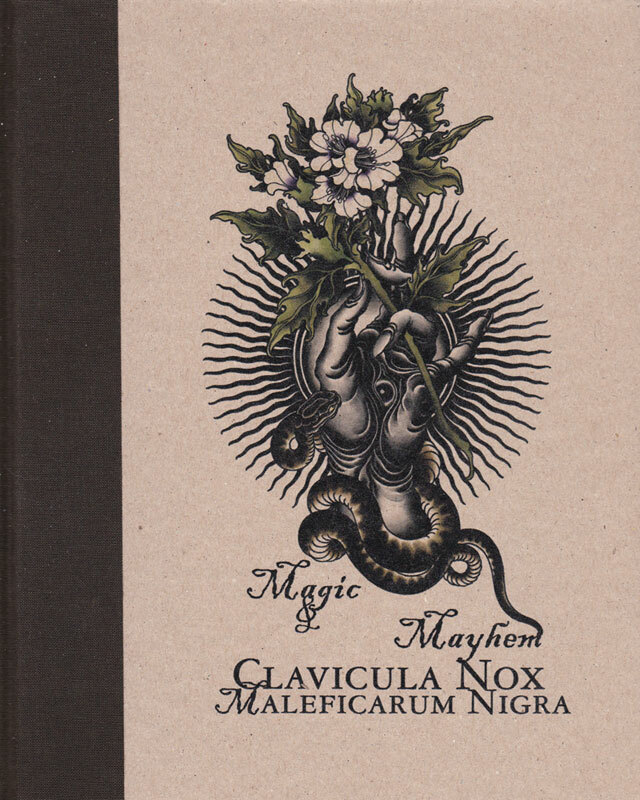 Previous issues of Clavicula Nox have always had a general theme (Lilith being the focus of the last one) and this one is no exception, with sabbatic witchcraft taking the spotlight this time. The proceedings kick off with a suite of poems exploring the wheel of the year and its festivals before Asenath Mason provides a survey of general sabbatic themes. Mason brushes with broad strokes, over the seven pages, covering various tropes associated with the Via Nocturna: the witches sabbath, the wild hunt, and initiatory encounters along the way of the night. As the subtitle Maleficarum Nigra suggests, one of the focuses of this volume is on malicious witchcraft, and so we have contributions from Gemma Gary and Frater Ben Nachash that both explore this theme. 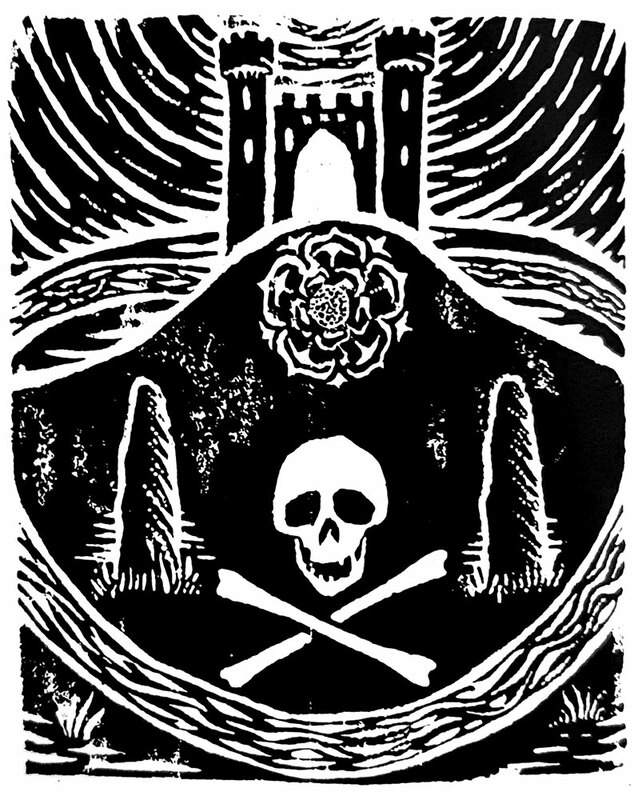 Gary’s West Country Curse-Magic gives a survey of various folk methods of cursing from the West Country in which the sympathetic principle in magic comes to the fore. These are relatively simple curses, and the ritual procedures are sketched roughly without much in the way of fastidious requirements and formulas. The same cannot be said for Frater Ben Nachash’s piece, which presents a Qayin-focussed ritual of cursing that is indebted to the work of N.A-A 218 in the Liber Falxifer books. The ritual requires nearly forty ingredients and is spread across various locations over three nights: the night of the tiller and the night of the killer, before culminating in the night of the gravedigger. To quote the infinite wisdom of the sage Dulce Brunneis: ain’t nobody got time for that. I can’t imagine disliking someone so much that I’d want to somewhat counter-intuitively invest that amount of time and effort, not to mention energy (in both the esoteric and psychological sense), in them. I think if it came to this, I’d just keep it West Country styles and stick a nail in their footprint, ooh arr, ooh arr. Another Qayinite ritual is provided by Nicholaj de Mattos Frisvold with The Commemoration of Lord Qayin, although this has less of a Templum Falcis Cruentis vibe than Ben Nachash’s contribution. The ritual dates from ten or more years ago and emphasises the transgressive aspects of the Qayin mystery, with the use of a skull (wood or bone options available) as a focus of meditation and adoration. A change of tack is provided by Sarah Lawless with a consideration of the poison path of intoxication; beautifully aided and abetted by a distinctly Helish illustration of datura by Kristiina Lehto. 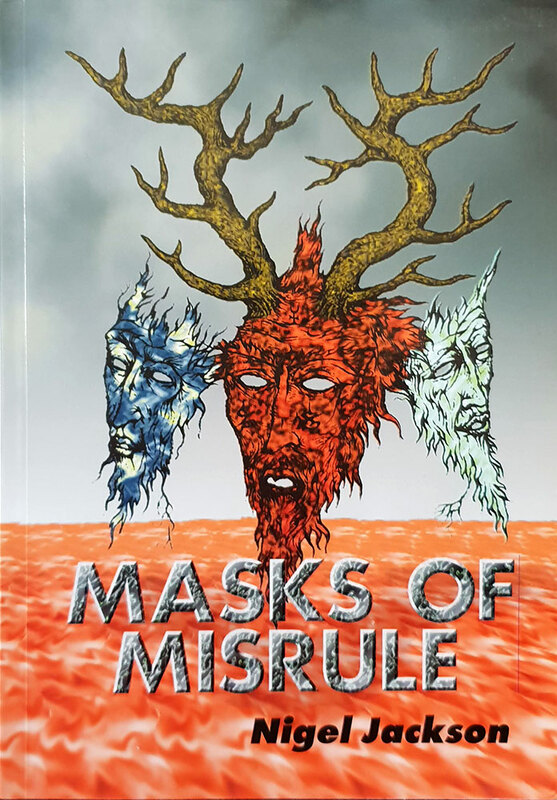 Lawless details her encounters with various plant spirits, first initiated through the alchemical art of mead brewing, in a journey that then encountered mandrake, henbane, and ultimately the yew tree; a suite of plants that I can understand the passion for. As with her skull-focused contribution to Scarlet Imprint’s anthology, Serpent Songs, Lawless writes with a poetic and enthusiastic style that guides the reader through her own very hands-on practice; a sharp and refreshing contrast with the obfuscatory smoke and mirrors that are thrown up by so many occult writers. At sixty pages and with contributions provided generous space, Clavicula Nox can feel a little slight and can definitely be a one-sitting read. 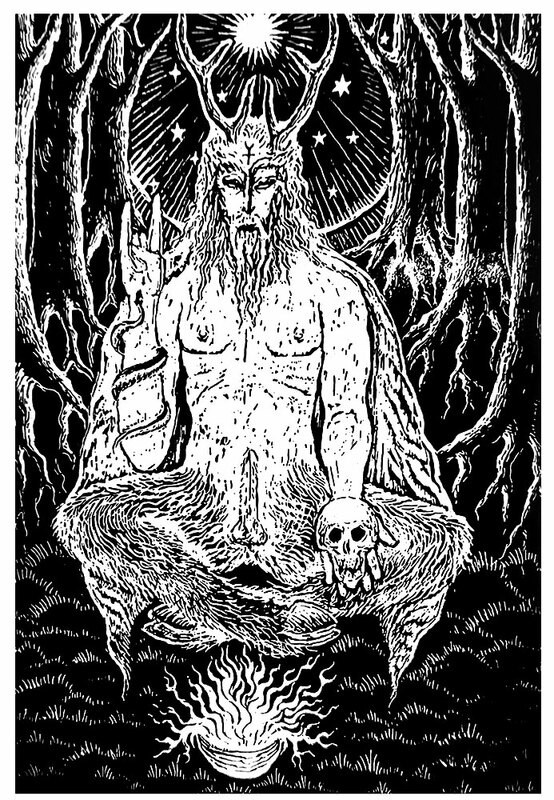 It is illustrated throughout with a range of full-page, full-bleed images that are truly esoteric in the sense of not giving much in the way of explanation within their dark vistas. These images come from a variety of contributors, but most share a similar painterly aesthetic that, with the matt printing, adds to the whole archaic quality of the journal. In the first Liber Falxifer, author N.A-A.218 presented a unique view of Qayin, seen through the lens of the Argentinian cult of Señor De La Muerte, in which the saint of death was revealed as an esoteric guise of Qayin (Cain). This theme is less prominent in this second volume; and that’s probably a good thing as the correlation between the two seemed to be an interpretation unique to the author’s Temple of the Black Light and one that was not entirely persuasive. While Liber Falxifer was divided into two somewhat contrasting halves discussing the exoteric and esoteric interpretations of Señor De La Muerte (and, as a result, felt a little disjointed), its sequel has greater focus, and employs a three part structure that includes a lengthy prose text, a herbal that explores the spirits of 72 different plants, and a series of necrosophic spells, prayers and rituals. The prose that begins the book is called Apocryphal Revelations of the Qayinite Genesis and provides a retelling of the Genesis narrative from a Qayinite perspective. It opens with a gnostic style discussion of metaphysical principles of creation, all “fullness of emptiness” divided manifestations and other Qabbalistic-style vagaries. At first, this comes across as a little grandiose and wilfully obtuse, but once the narrative moves from the cosmic perspective to a more, how you say, human one in the Garden of Eden, things become more engaging. The centre piece of this narrative, and indeed of the whole book, is the relationship between Qayin and his twin sister Qalmana, who are set in opposition to Abel and his twin Kelimat. Although not in the biblical record, this is an idea not without precedent, specifically in midrashic literature. 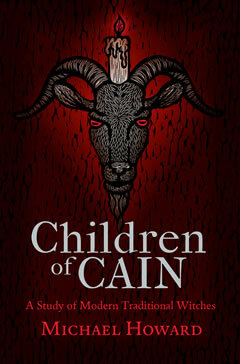 The Genesis Rabbah, for example, refers to Cain being born with a female twin, and Abel with two twin sisters, while the Chronicles of Jerahmeel explicitly names Cain’s sister as Qalmana but calls Abel’s wife Deborah. No claims are made as to whether these apocryphal revelations are meant to be an inspired modern transmission, or an ancient text handed down through the temple; or if they were made up on the spot from whole cloth just the other day. It is, however, an effective and engaging narrative. Whilst the Qabbalistic-style abstractions of the first part are a little bewildering and tedious, by the end, the retelling of Qayin and Qalmana’s story becomes a coherent mythology that rings true, on some level, as genuine gnosis. Qalmana herself is an intriguing god form and this is the first time that any consideration of her has been presented by the Temple of the Black Light. 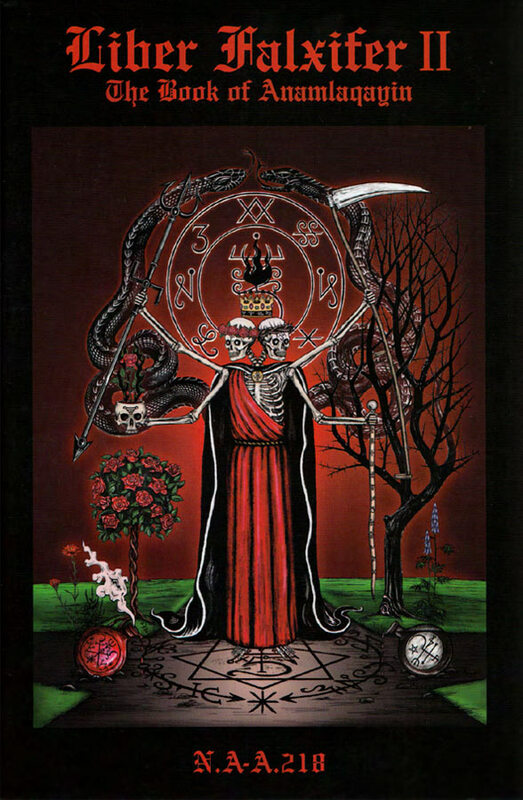 She has parts of Lilith, Babalon and Hela about her, being presented as a sickle-wielding decapitated-head-holding dark goddess, who in one appellation is rather gloriously called the Queen of the Rose Gardens of Nightside Venus. Following this guide to the 72 Black in Green is a lengthy section of ritual and magickal applications for these and related spirits, presenting what amounts to a green grimoire. These include a procedure for bonding with a dryadic famulus, another for making a tincture of Qayin, and for making sorcerous inks empowered by the Black in Green. 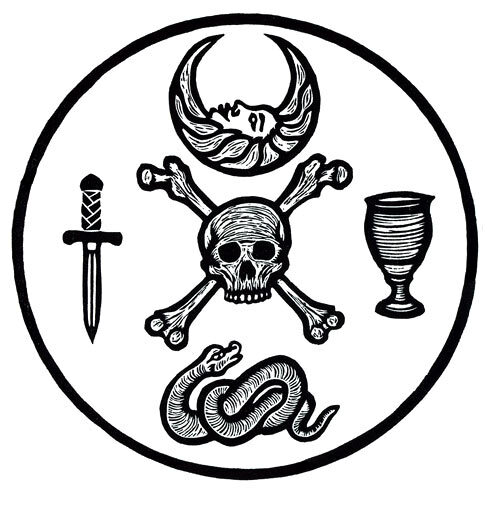 There are also a selection of prayers and techniques for working with talismans, effigies, and even a homunculus useful for deflecting magical attacks. 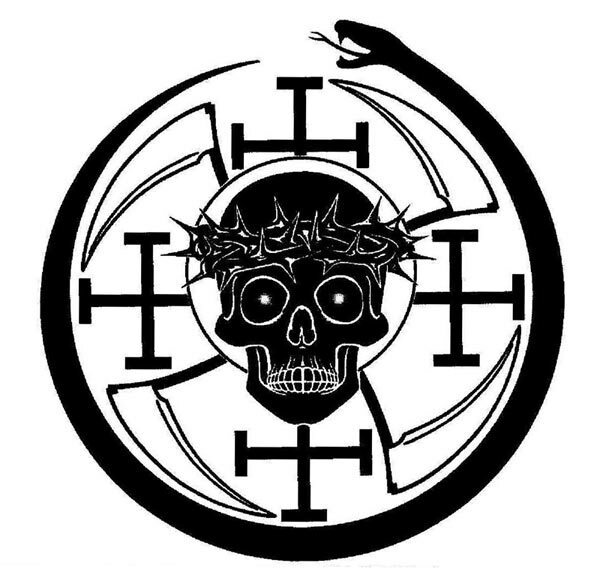 The final section of the book, The Zenith and the Nadir of the Black Cross and the Secrets of Gulgaltha, deals with the spirits of the Mighty Dead, those beings who have passed over to the Other Side and attained immortality in their release from hylic rebirth. The first of these Mighty Dead are Qayin and Qalmana and their eleven direct descendants, whose names come from the biblical record and apocryphal sources. 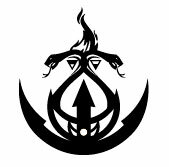 These are only briefly considered and it would seem that a richer understanding of these figures is a work in progress; although, this being the book it is, they all have sigils already assigned to them. Another of the Mighty Dead, and one of particular interest, is Abel, who is seen here as someone who, in passing over to the Other Side and into the world of the dead, has undergone post-mortem Stockholm syndrome and become aligned with Qayin. 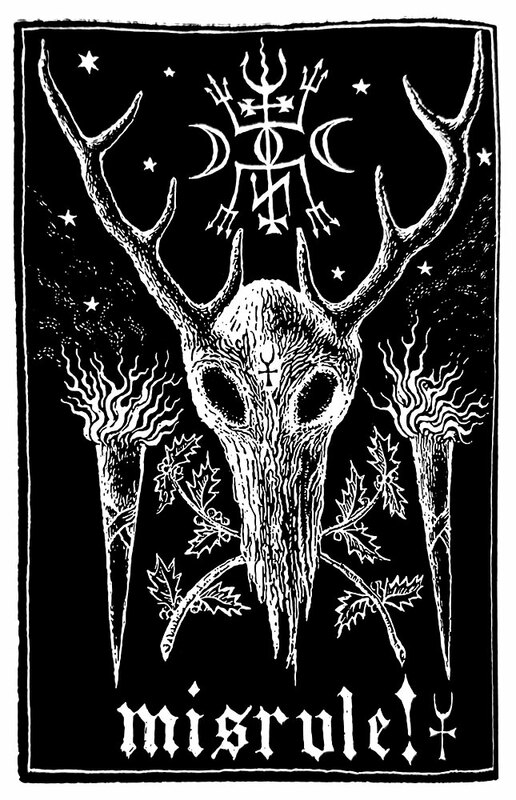 In death, Abel the Black is seen as the keeper of cemetery gates and, as an analogue of the canine folkloric figure of the Kyrkogrim (believed to protect church yards in Scandinavia), is sometimes said to appear as a three-headed dog, restrained with three leashes of thorns, gold and fire. Liber Falxifer II concludes with an egressus that discusses the dual and combined natures of Qayin and Qalmana; the Anamlaqayin of the title. Throughout Liber Falxifer II, N.A-A.218 writes with the surety of tradition, presenting the workings and philosophy of his order with an authoritative tone that only occasionally makes recourse to other sources. 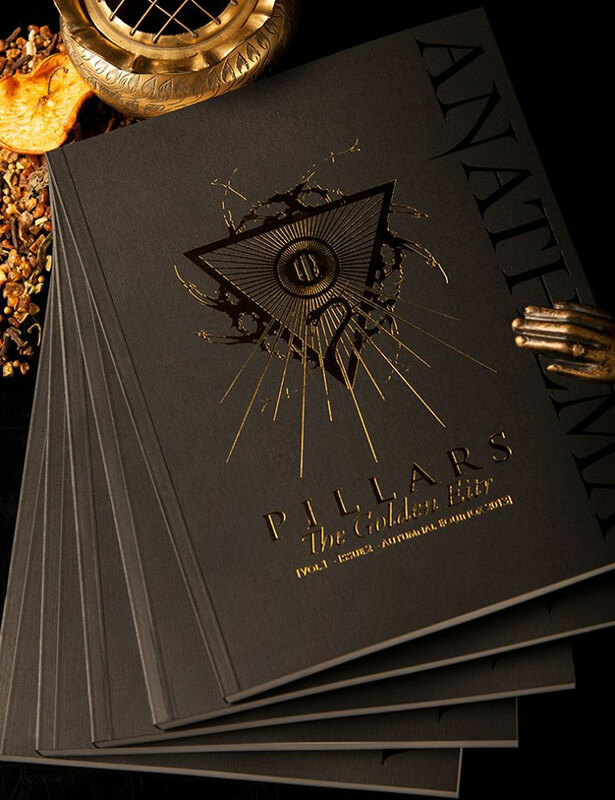 Liber Falxifer II is beautifully presented with a full colour dust jacket over a gold embossed black cloth exterior (with cloth bookmark!). At over 470 pages, it is a weighty tome and is immaculately formatted and typeset with an occasional full page pencil and ink illustrations by Soror Sagax.218.